5 years ago I stumbled upon a 12 week class teachings of the book, The Artist’s Way: A Course in Discovering and Recovering your Creative Self. Feeling the flow of my personal journey, I immediately signed up, excited to dive deep and learn more about myself. One of the weekly exercises given to us: blow bubbles in a place that one would normally never blow bubbles. At first I thought this was a joke, I mean, my task was to blow bubbles? How could learning be so fun??? Our assignment: to take notes of how it effected not only ourselves, but those around us. I was all over this Â challenge and could hardly wait! Where to go? What would the outcome be? Little did I knowÂ this assignment would not only change my life for the better but also become a beautiful way for me to Turn Strangers Into Friends. I tossed my yellow bubbles bottle in my tote bag and headed to a coffee shop near the beach. It wasn’t crowded, only 5 people in the shop, all in their own worlds, unaware of each other, playing on their lap tops, reading a book or writing a paper. Â I specifically chose a table in the middle of the room, sat down with my notebook, pulled the my bubbles out of my bag, slowly brought the wand to my mouth — and- oh….wait…what was this feeling in the pit of my stomach? Why was I hesitating? I glanced around the room. No one was looking at me. But, for a split second and had to gather my thoughts and take a deep breath, I mean, I was about to blow bubbles inside a quiet coffee shop! It felt a tad awkward. And so it began: Bubbles Bringing Everybody Together. Before I knew it, everyone in the shop was involved with the conversation, volunteering stories, asking thought provoking questions, enjoying each other’s company. The coffee shop was filled to the brim with life and fun story swapping! Turns out one guy actually brought bubbles with him while he traveled to poverty stricken countries to share with the children of families he would stay with. HOW COOL! Â As I continued to write about my own experience, my own happiness continued to bubble up inside of me. The following week in class, we took turns telling our bubble tales. One gal blew hers in an elevator (awesome!) another while shopping in Target (I’m sure the kids got a kick out of that!). But on the flip side, a few blew them in their car during traffic or more surprising to me, Â two people could not find the time to blow their bubbles. How could that be? ItÂ made me sad, knowing how much joy the bubbles brought me. It was then my teacher explained that the act of “blowing bubbles” and drawing attention to ourselves was really an exercise in overcoming FEAR. Â AH… now I got it. Stepping out of our comfort zone, embracing the unknown. I smiled knowing I passed this test with flying colors… or rather, flying bubbles! FEAR, as he explained it means: F*CK EVERYTHING AND RUN – or- FACE EVERYTHING AND RECOVER!Â Life is a constant flow of choices based on either love or fear. Had I chose to hide from being seen with bubbles I’d have missed out on a memory making moment, meeting amazing people, an experience powerful enough to share with all of you. Fortunately, I made my decision based on LOVE, from a place in my heart. I did not see it as fear vs success but rather living in the moment. I didn’t believe my actions could hurt anyone. My inner child embraced the idea and my soul smiled. Â Many times when we are scared to do something we create an excuse, one we will defend with honor, and our ego will justify until we are blue in the face. Our job is to step through our perceived set back so our spirit can shine! Rather than spend your energy convincing yourself why not to do something, TRY IT, step out of your box, embrace the bubbles in YOUR life! What you need:Â Bubbles. Party City has an excellent supply. What will happen:Â People will laugh, smile, look at you strangely, ask you if you are doing a social experiment, ask to blow them with you and even start telling you their favorite bubble story. Have you ever seen an angry person blowing bubbles? NO. Because… they make people happy. AND, what is the best way to meet people: make them happy! 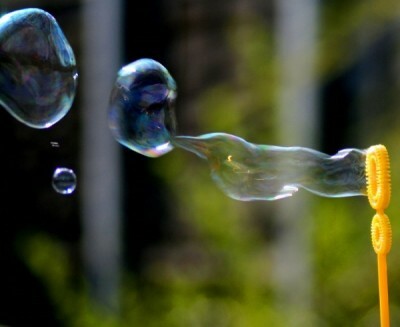 When it comes to blowing bubbles, the sky is the limit (yes, pun intended) but here are a few suggestions on where practice your Bubble Blowing Skills! â€¢Â Â Â Â On a Patio: I like to think that any time we are outside in fresh air, we are enjoying life! Spark a smile & watch your bubbles dance to the sky. â€¢Â Â Â Â Parties:Â ever go to a party and not know a soul? Fear no more! Be the one to show up with Bubblesâ€¦ and you are an instant Party Favor Pal! â€¢Â Â Â Â TRAVELING/AT THE AIRPORT: pack them in your day sack, your back pack or buy the 2 oz bottles & carry them in your purse or pocket. While waiting on a lay over, catching a train or sight seeing in a new cityâ€¦ you and your bubbles will leave a lasting impression.